Brady McGraw grew up in middle Georgia on his family’s farm. Once a month he steps back 40 years to see the cows and occasionally bump into an old friend at Dairylane. 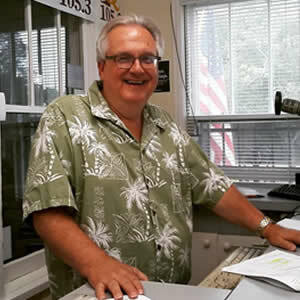 He has lived in mostly Savannah since 1975 when he came to work with Jerry Rogers at WSGA. Best Concerts Ever Attended: Homegrown Holiday Hoedowns & the CD release parties for the Accomplices. His son, Zachary, and daughter-in-law, Colleen, are in the group. The shows are more like festival with lots of friends and family there. Favorite Movie: Tombstone, he wishes he could be as cool as Doc Holiday!